Schott Enterprises, LLC (SE) core business is to lease established industrial facilities and build-to-suit buildings as needed. SE has a total of 7.45 acres of which approximately 3.5 acres can used for industrial structures. As of October 2007, there will be the first 10,500 sq. ft. building containing six bays of 1,750 sq. ft., each. The remainder of the acreage may be used as clean vehicle storage (trailers, boats, and recreational vehicles.) Three additional buildings are planned for SE equal to and larger than the building now under construction. Market needs will determine sizes and interior spaces of future buildings. 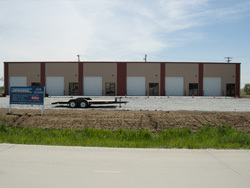 SE has selected 619 Wiles Road, Plattsmouth, Nebraska 68048 (its newest industrial park) as its location. SE has found a community friendly to business and eager to assist in drawing other businesses to the area. "Bring your business and your dreams"
Schott Enterprises, LLC is waiting to provide new, clean and	professional facilities for your future business.